This is an adaptation of the familiar childrenâ€™s game â€˜Musical Chairsâ€™ that makes it more physical and exciting for teenagers! Numbers: groups of around 10 or over. Best with a large group of 50. Suitable for: young people aged 11 and over. Venue: a medium to large sized hall. Safety First: The game involves some running and some physical contact. Set up a circle of chairs in the middle of the room facing outwards. There should be nearly enough for every person playing. At one end of the room away from the chairs, set up a ‘safe zone’. This could be marked by tape on the floor or by placing cones or other objects around it. The game is played just like regular Musical Chairs. People walk around the circle of chairs until the music stops, and they then have to quickly sit down on an empty seat. As there are fewer chairs than people, this often results in pushing and shoving. This is where the extreme part comes in. 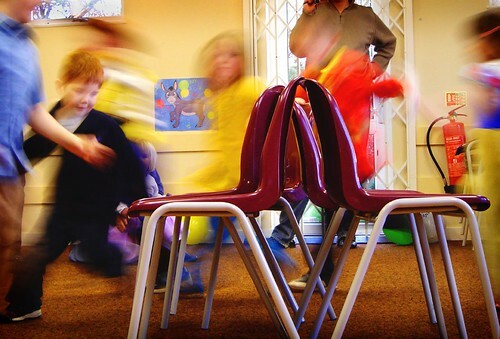 Any person that did not manage to sit on a chair has to quickly run for the safe zone while leaders (or selected young people) throw the balls at them. If they make it to the safe zone without being hit, they are free to play the next round. If they do get hit by a ball before they reach the safe zone, they are out and have to watch from the side. If the players run to the safe zone and there are still chairs available in the circle, they must run back and try to get onto the chair. This adds an element of excitement to the game and gives the players a chance to remain in. Once everyone is either safe or out, the next round starts and some more chairs are taken away from the circle. Keep going until only 2 people are left in. 2 responses to Extreme Musical Chairs!